Rincon-Vitova Insectaries grows several species of tiny Muscidifurax and Spalangia wasps that attack fly pupae. Besides being extremely effective, they are virtually unnoticed by humans or animals. Mixtures are adapted to different climates with a higher proportion of Spalangia in proportion to Muscidifurax as seasonal temperatures rise. These Pteromalid parasitic wasps have a biological radar for finding fly pupae in manure and other fly breeding sites. In 1972, the Rincon-Vitova team led by Everett Dietrick with University of California at Riverside colleagues pioneered mass-rearing of fly parasites, that have since helped reduce or end the need for pesticides for flies. There are many beneficial insects that destroy all life stages of flies. Beetles and mites devour fly eggs and larva and the adult fly stage is partially controlled by natural disease. Fly parasites and Hister beetles are two natural enemies of flies that it is feasible to mass produce. A successful fly control program includes conservation of all the natural enemies of flies as well as elimination of habitat and trapping of adults as needed. We call this our three-pronged approach. The key to a successful fly parasite releases is to start early, and make scheduled releases throughout the fly breeding season. Use of supplemental control methods such as sugar baits, fly traps, manure and breeding habitat management, etc. help greatly to reduce the number of commercial fly parasites needed. Factors influencing the quantity of fly parasites to release in a particular site include the season of the year, weather conditions, suitability of manure or breeding media, number of animals in a particular area, migration of adult flies into the control area, etc. To release the fly parasites, keep them in a warm place, about 70 to 80 degrees, and check for emergence from the fly pupal casing by simply opening the paper bag and looking for the small ant sized parasites moving around. When you see several crawling inside the bag, sprinkle the contents in the fly breeding area, such as manure piles or moist areas. Fly parasites are packaged in units of 10,000, minimum orders of 5,000 or in bulk units of 50,000 and 120,000. Most users receive shipments at intervals of 2 to 4 weeks. The following topics describe our three-pronged approach to biological fly control using fly parasites. Parasitic wasps lay their eggs inside fly pupae and the developing flies provide food from within for the young wasps. In addition, adult parasites "host feed" by drawing fluid from fly pupae, and thus prevent the fly from fully developing. They are very effective against the housefly, biting stable flies, garbage flies, and the lesser housefly, which comprise 95 percent of the flies in manure accumulations. They also parasitize the other 5 percent of flies, such as horn flies, flesh flies, face flies and false stable flies, but control is less complete on those flies which complete their life cycle widely dispersed in the pasture. The parasitic wasps only attack flies and will not bite, sting, swarm or bother anything else. They are nocturnal and are rarely seen during the day. Fly parasites operate to a depth of 8 inches in manure, homing in with their biological radar on fly larvae that are about to pupate. Fly parasites complete a generation every 3 weeks (from parasitism of the fly pupa to emergence of the adult), yielding a steady reproduction of parasites. The adult wasp lives about 10 days. The parasite populations increase geometrically and reductions in flies can be expected in 4 to 6 weeks. They are designed to find and kill the last fly at your location. However, flies still can be migrating in, hence, biological control works best if the whole neighborhood uses it. A successful fly control program keeps the number of adult flies down. Why? A single fly will lay up to 800 eggs, but a single parasite will attack less than 50 fly pupae developing from all those fly eggs. Flies also have an advantage of a shorter life cycle (8 days in hot weather up to 14 days in moderate weather) giving greater reproductive capability, and are able to travel greater distances. Flies resist the effects of pesticides more than do the parasites. Because the fly has the edge, the population of fly parasites needs continuous reinforcement through augmentative releases of insectary-grown parasites to maintain a high level of fly control. Sanitation to eliminate conditions favorable to fly breeding helps limit flies. Frequent manure removal helps, but leaving a little of the top layer of manure in place saves some of the complex of beneficials that helps kill flies. Maintain ventilation, keep manure dry and eliminate wet areas where possible. Large amounts of manure can be managed in a pond or storage where non-aerobic digestion is accomplished or by aerobic composting systems. Unprocessed manure can be piled and covered. This reduces the surface; heat builds up to reduce fly breeding. Dry manure does not breed flies. The interface between wet and dry manure that has a moisture content of 50 to 80 percent is where flies breed. This is also where fly parasites work. Parasites are counted by the number of parasitized pupae adjusted by a factor of 25% (a maximum number of fly pupae that were killed without yielding parasites). In Rincon-Vitova's standard mixture of solitary and gregarious species, the average yield of parasites is 2 for each fly pupa. Bear in mind, however, that species ratio is also important. The more Spalangia and Muscidifurax raptor and zaraptor in the mix, the lower the total number of parasites, but the better the diversity for tolerating hot and cool weather, respectively. Therefore, though the average yield per FP10 (10,000 fly pupae) is 20,000, we guarantee a minimum of 15,000 wasps for any of our mixes. Ironically the cost to produce a mixture of wasps with a higher proportion of valuable species, such as Spalangia spp., results in fewer total numbers of wasps, but is a higher quality product in hot, arid conditions. By contrast, a higher proportion of Muscidifurax raptorellus yields several times the number of wasps, but their tolerance to temperature extremes is less. Factors affecting recommended numbers of parasites include numbers of flies, amount of manure or other organic matter, moisture content, humidity, temperature, existing beneficial controls, chemical usage, use of bait traps and incoming migrations. Starting guidelines are based on 500 to 1,000 parasites per large animal per month depending on concentration of manure and 2 parasites per small animal per month, doubling up when fly problems are severe and cuffing back when the parasites are well-established and the weather is cooler and drier. Stables (up to 30 horses) 1-2 colonies/month scheduled every 2-4 weeks. Feedlots (appr. 1,000 head) 5-14 colonies/month scheduled every 1-2 weeks. Dairies (appr. 100 cows) 3-7 colonies/month scheduled weekly. Poultry (appr. 10,000 breeders) 2-4 colonies/month scheduled every other week. Poultry (appr. 10,000 layers) 1-3 colonies/month weekly or biweekly as manure piles up. Compost (per 100 cubic yards) 5-15 colonies/month scheduled weekly or biweekly. It is easier to prevent a build-up of flies than to get rid of them. A few flies always survive the cold and drying conditions of winter in the pupa stage. Parasite releases should be made early each spring at the first sign of emerging or immigrating adults to minimize the numbers of adult flies laying eggs. Very early releases can be smaller in number, increasing in quantity at the first signs of active breeding. Once established fewer parasites are needed to maintain an effective number. A few may overwinter outdoors, but yearly augmentation is necessary. These parasitic wasps arrive developing inside the fly pupa. When fully grown, they cut a hole in the pupa case and exit as adults searching for more fly larvae, seeking to lay their eggs where the flies pupate. The date on the bag is an estimated emergence date. Sprinkle a small handful or spoonful of the parasitized fly pupae in wood shavings either on manure or in furrows and lightly cover to protect from birds. The widest possible dispersal around fly breeding areas is best. Locating the fly breeding sites is critical to using the fly parasite effectively for fly control. Fly parasites should be released around any area where maggots are seen. Places to look for these sites are in and around coops, kennels, barns, stables, and stalls, with special attention to maternity, hospital and calf pens on dairies and fence lines and feed bunks on feedlots, and wherever straw bedding is provided for animals. Place also around corral posts, fence lines, paddock areas, and other dropping sites, at the edges of manure piles, pits or carts, and wherever manure accumulates. Other fly-breeding areas are near (but never directly in) water sources and decomposing matter in garbage cans and septic tanks. Rincon-Vitova's fly parasite release stations are more popular than ever both for the protection of fly parasites from predators such as birds and rodents, but they also make it easier to train helpers to distribute a standard amount where you want. Fly parasites must not be left in direct sunlight or hot areas. If ordered fresh, they may be held at 70° - 80°F, increasing to 85 ºF for more rapid emergence; otherwise, they are emerging and ready to release within a day or two. Cold storage shortens life and may harm reproduction. Avoid chemical sprays within 48 hours of release. Rincon-Vitova offers screen mesh packaging for hanging in barns where floors are washed regularly or predation by rodents is likely. Bait traps are economically and safely used to trap large numbers of adult flies without interfering with biological controls. Lowering the adult fly density before seasonal hot weather arrives and during the period of time that it takes for the beneficials to reproduce to larger numbers in the manure results in less fly problems during the first few weeks of summer. Some chemicals or nonpoisonous materials also come as sugar baits and fed to the adult flies. In humid areas and in wet manure accumulations, especially where manure is washed into pits, it takes both releases of parasites and bait stations to give excellent fly management. Set up one bait trap inside each barn or shady area when you start releasing parasites. The number of traps should be increased along with parasite releases until adult flies are gone. To assess the parasitism of fly pupae in manure, fly pupae can be separated from the manure by flotation. Agitation will float the pupae to the surface. Pupae that are old enough to have been exposed to parasitic wasps change from reddish to dark brown. Up to ten percent of these will not develop into flies. Those yielding flies have the end of the pupal case broken off. Neatly cut escape holes are evidence of parasitism. Check 100 dark brown pupae in a week for parasitism and dead intact pupae to get parasitism rate and possible parasite-induced mortality rate. Since adult flies are the pest, a reduction in the number of adult flies is the best measure of a successful integrated fly control program. Fly tapes hung to attract and count changes in adult fly populations work best. Biological control works because of the entire complex of insectary-grown and naturally-occurring predators and parasites of all stages of flies. All natural enemies of flies are susceptible to pesticides, particularly when directed at manure. Reduce adult populations with poison baits. Spray only adult fly resting areas with long residual pesticides; never spray breeding sites directly. This way you will conserve the natural enemies, prevent the development of resistance and reduce toxic pollution. Herbal essential oil sprays used regularly on animals to repel adult flies and suppress lice may may also kill insects in direct contact. One example is Ecto-Phyte from Agri-Dynamics in Martins Creek, PA . Current price is $60 per gallon but a little goes a long way of this high quality mix of vegetable and essential oils. 1. Release enough fly parasites early, when flies appear and before it warms up. 4. Clean manure leaving a pad or reserve where beneficial organisms have built up. 5. Eliminate wet areas where possible. Use hydrated lime where animals urinate frequently. Keep manure dry with good ventilation and clean up feed spills where possible. To get started, find a medium to large plastic bucket and some fiberglass window screen approximately 24 in. by 42 in. You will also need a dowel or narrow stick approximately 3 ft. long, and some twine or duct tape. To set up the bait, you need a quart of molasses in three quarts of water. To complete the station, a can of dry poison fly bait at the feed store and spray bottle of water. 1. 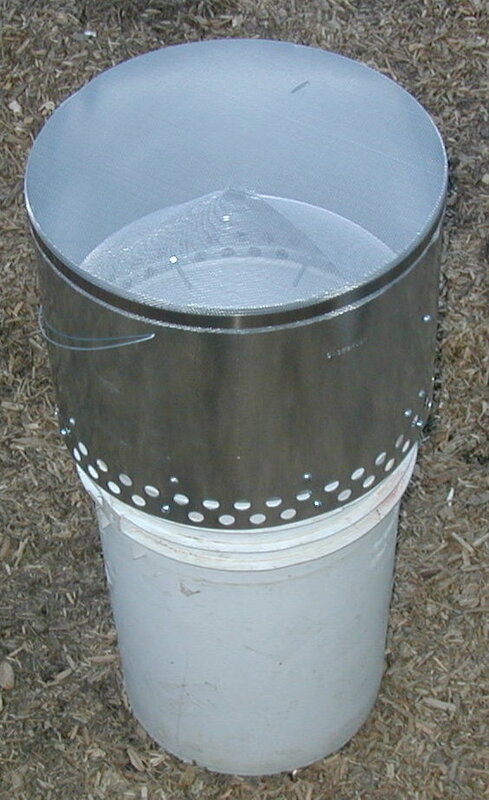 Wrap fiberglass screen around bucket and overlap (fold over twice to seal seam). 2. Fasten lower edge of screen to top edge of bucket with twine or tape to keep flies out! If adult flies enter, they will contaminate the molasses attractant so it won't last as long. 3. Mix well 1 quart of molasses in 3 quarts of water in bottom of bucket to serve as a fly attractant. Replace water lost by evaporation in molasses solution when necessary. 4. Place dowel stick In bucket to support screen, then fold over top edge of screen to seal. 5. Using tap water in spray bottle, wet screen all around. 6. Sprinkle wet screen with DRY fly bait so bait sticks to screen. Replace bait as needed. 7. Place bait station in areas where flies congregate and move to determine best site shady locations In summer and sunny locations In winter. Station may be hung out of the way by attaching wire with hook to the sides of bucket. 8. This bait station functions without care for up to 5 weeks provided molasses mix continues to grow yeast Instead of putrefying bacteria. ---Keep station out of reach of children and pets. ---Follow safety precautions on fly bait label. Wash hands after work with the station. Adapted from Agricultural Extension Bulletin, San Bernardino County, CA, June 1974. Minimum Contents: 7,500, 15,000 or 75,000 fly parasites (from 5,000 or 10,000 or 50,000 pupae); 75% minimum parasitism; no live flies. Approximately 50% wood shavings by volume. Description: Small parasitic wasps are shipped developing inside fly pupae; some adults are emerging on delivery unless otherwise requested. Wasps will only attack fly pupae and do not bite, sting, swarm, infect or otherwise bother humans or animals. Wasps usually search under surface of decomposing organic matter. Storage: Storage shortens life and may reduce reproductive capacity. If release must be delayed, open box and hold at 50'F (10'C) and 40-60% RH with good air circulation for only a few days. Guarantee: Alive and in good condition. Open package and report any problems immediately. Host Pests: Housefly, biting stable fly, garbage flies and lesser houseflies, etc. Development: Egg to adult life span is 16 or more days depending on temperature. Hold at 60º to 90º F (15º to 32º C) with good air circulation. Keep out of direct sun. Ready to release immediately or within 48 hours unless receiving unincubated pupae. Sprinkle widely around edges of organic matter where flies lay eggs and pupate. Pouches of mesh or plastic can be used as release stations where damage or predation is likely. Pesticides: Susceptible to pesticides, particularly when directed at manure. Careful placement of pesticides minimizes harm. Reduce adult fly populations with traps or poison baits. When applying pesticides with long residual activity, spray only adult fly resting surfaces to minimize the impact on the parasites. New Organic Pesticide Available: Balence contains a naturally occuring fungus that eats flies. Simply mix with water and fog areas with adult flies. This has very little effect on beneficial insects and wildlife such as birds, frogs, and lizards.